Make your own homemade non-dairy easy coffee cream recipe in just 5 minutes. Super rich and creamy. 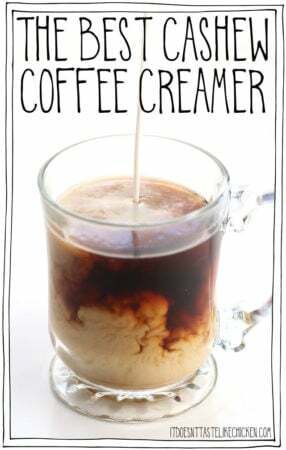 Customize to your own taste preferences for the best coffee creamer you'll ever taste! If you do own a high-powered blender, this step isn't necessary as the blender will be powerful to make a very smooth cream without soaking. If you do not own a high-powered blender, I recommend starting by softening the cashews for the creamiest coffee creamer. To soak the cashews: add the cashews to a bowl, and cover with water. Let soak for a minimum of 6 hours and up to 48 hours until very tender. Drain and rinse cashews before using. To make the best cashew coffee creamer: Add the cashews, water, sweetener (if using), vanilla extract (if using), and salt to a blender. Blend until completely smooth and super creamy with no graininess. The key is to blend way more than you think you need to. I blend mine for 3 - 5 minutes in my very high-powered blender to ensure maximum creaminess and no pulpiness is left. By the time I'm done the cashew cream is actually a little warm from the friction. Pour into a bottle and store in the fridge until ready to use, it should keep for about 1 week in the fridge. Always give the creamer a shake before using. For the water: I recommend starting with 1 1/4 cups water which will make a very rich cream, and adding more water if needed to reach desired consistency. For the flavourings: sweeteners and vanilla are optional. I recommend starting with smaller amounts of sweetener and vanilla to start as you can always add more to taste later. My personal favourite proportions are 1 1/4 cups water, 4 tablespoons sweetener, and 1 teaspoon of vanilla extract for an extra-rich sweet French vanilla creamer. Bonus flavours: pick different coffee syrups or extracts for endless flavour combinations. Hazelnut, chocolate mint, and peppermint all sound super delish! Just make sure to check that it's vegan before purchasing. *Calories are based on one serving (about 2 tablespoons) without added sugars since they can vary in calories.